Book News: Experimental Debut Novel Wins Prestigious Baileys Prize : The Two-Way Also: A book at one of Harvard's libraries is "without a doubt bound in human skin"; J.K. Rowling has released an excerpt of her new novel. 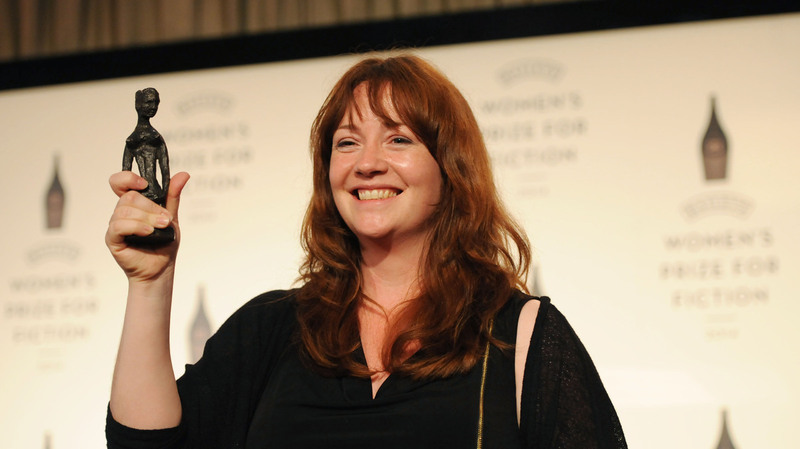 Eimear McBride won the 2014 Baileys Women's Prize for Fiction for her debut novel, A Girl Is a Half-formed Thing. The novel was rejected by publishers for almost a decade. With her first novel, Eimear McBride has won the Baileys Women's Prize for Fiction (formerly the Orange Prize), one of the U.K.'s most prominent literary awards. A Girl Is a Half-formed Thing is a gorgeously odd novel about illness, abuse and growing up. But McBride's style, which she has called an attempt to capture "the moment just before language becomes formatted thought," is the most remarkable aspect of the book. In one passage, in which the narrator describes her sick brother's stay in a hospital (the book is addressed to him), McBride writes: "Weeks for you. Weeks it. Scared and bald and wet the bed. Dark trees for me outside when it weather rains. She praying in a coat until I am froze. Hard chapel kneelers bare-kneed real repents. She does. And our father was. Where? Somewhere there. I think." She told The Guardian, "I'm interested in trying to dig out parts of human life that cannot be expressed in a straightforward way, that don't fit neatly into the vocabulary and grammar that are available. To do that you have to make language do something else." It took McBride almost a decade of rejections to get her novel published. In her acceptance speech, she said, "I hope that [the prize] will serve as an incentive to publishers everywhere to take a look at difficult books and to think again." A book in Harvard's Houghton Library is "without a doubt bound in human skin," according to a post on the library's blog. Scientists tested particles from the binding of Arsène Houssaye's Des destinées de l'ame (or Destinies of the Soul) to determine that the skin's amino acids were human. The inscription reads, "A book about the human soul deserved to have a human covering: I had kept this piece of human skin taken from the back of a woman." According to a book description on the library's website, the skin was "taken from the back of the unclaimed body of a woman patient in a French mental hospital who died suddenly of apoplexy." Other books at Harvard thought to be bound in human skin have recently been found to be animal hide. J.K. Rowling has released an excerpt of her new novel The Silkworm, the sequel to last year's novel about private detective Cormoran Strike, The Cuckoo's Calling. Both books were written under the pseudonym Robert Galbraith. The first two chapters are up on her website: "Traffic was already rolling busily along Charing Cross Road by the time Strike emerged from the Tube. The November dawn was breaking now, gray and halfhearted, full of lingering shadows. He turned into Denmark Street feeling drained and sore, looking forward to the short sleep he might be able to squeeze in before his next client arrived at nine thirty." A new book contends that James Joyce, who suffered from partial blindness throughout much of his life, had syphilis. In an interview with The Guardian, Kevin Birmingham, author of the forthcoming The Most Dangerous Book, said, "Add to Joyce's treatment (and his penchant for prostitutes) the fact that syphilis is virtually the only reasonable explanation for Joyce's decades of symptoms, and it seems rather difficult to refute."